This Wednesday, the UK's prime minister, Theresa May, is expected to start the clock on Brexit. Taoiseach Enda Kenny described what's about to happen as 'the most important negotiations in our history as an independent State'. So, what's about to happen, what's at stake, and what should we be doing about it? The European Union (Notification of Withdrawal) Bill 2016-17 is about to be passed. With that, Prime Minister May will send a letter to the European Union regarding the UK's withdrawal. The European Parliament, which must vote through the UK's withdrawal, will quickly pass a resolution stating its views on the withdrawal. The heads of state for the EU27 (the European Council) will meet in the first week of April to issue high-level guidelines to the European Commission on how the negotiations should proceed. The commission will then take three or four weeks to turn the guidelines into detailed negotiating directives. These will then be given to the Brexit Task Force, led by Michel Barnier, to conduct the actual negotiations with the UK. Initial talks will focus on the 'divorce', not the future relationship. The UK wants both discussed in parallel, but the view from Brussels is that the 'divorce' talks must start first. Only if these go well will the task force seek a mandate to open informal talks on the future relationship, including trade. Article 50 allows two years for the divorce talks. Both sides can agree to extend the period by one year. Both sides can also agree a transitional period. It's possible the 'divorce' talks will be completed within the two years, but few believe the future relationship talks can be. Without a transitional period, a 'cliff' would be reached, with the UK no longer party to EU treaties or sectoral agreements. Right now, the range of potential outcomes is wide open. The most benign of these, and the best for Ireland, would be that very little changes. For example, Norway, Iceland, Lichtenstein and Switzerland are members of EFTA, the European Free Trade Association. These countries are not members of the EU, but participate in the EU's single market. Were that to happen, trade and movement between Ireland and the UK could continue with minimal disruption. On the other end of possible outcomes would be this 'cliff'. This could include planes from the UK not being able to land in EU countries, heavy restrictions on people moving between the UK and EU and serious barriers to trade snapping into place. Such an outcome is extremely unlikely, but is the 'do-nothing' scenario. In other words, it's the outcome that kicks in if an alternative isn't found in time. Unfortunately, the signals from the UK are that an EFTA-style outcome is also unlikely. The Brexit referendum didn't demand a hard Brexit, but the UK government has gone there anyway. 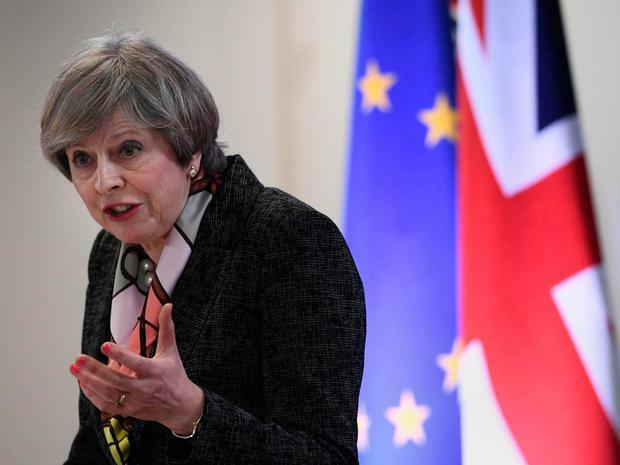 Prime Minister May has stated that the UK will leave the single market, and that no deal (the cliff) would be preferable to a bad deal. For Ireland, big issues include maintenance of free trade and free movement with the UK, avoiding a border with the North, and the rights of citizens in Britain, Northern Ireland and the Republic. But what's concerning the EU and UK? On the 'divorce' talks, the commission has three core issues. The first is the reciprocity of rights for UK citizens in the EU, and vice-versa. The second is the settlement bill it wants the UK to pay for its current and future EU obligations. The third is borders, with a big focus on Northern Ireland. There are differences of opinion as to what would be acceptable, including a border imposed around Britain, rather than Britain and Northern Ireland.On the future relationship, the UK wants free trade for specific industries like financial services and cars. But it wants out of the single market, mainly to be able to stop Europeans coming into the UK. The EU view is that there will be no sectoral deals. As one politician put it, 'If you're out, you're out'. During the Brexit campaign, prominent Leave members argued that Britain would get a great deal on trade, as the EU needs the British market. But that doesn't appear to be the mood in Brussels. There, there's a sense that what takes priority is the unity of the EU, and that if certain sectors have to take a hit to protect the European project, then so be it. This combines with a strong view across the European institutions that whatever the final deal, the UK must be worse off outside the EU than in it. On trade, there has been a lot of talk in Ireland of future tariffs. If, for example, the 'cliff' is reached, tariffs will kick in at the default levels for the World Trade Organisation. While some are small, tariffs in sectors like agriculture are high, such as over 50pc for beef. But just as importantly, if the UK no longer signs up to EU regulations (food standards, for example), there will be very significant barriers and costs to Irish businesses trading with the UK. The short answer is 'a lot, and very quickly'. We're negotiating on the side of the EU, even though for the most part, what's bad for the UK in these negotiations is bad for Ireland. We must advocate for no border controls on the island. We must emphasise the economic threats to Ireland, which seem less well understood in Europe than the political situation regarding the North. We must make the case just as strongly in the EU capitals as we are in Brussels. The sense is that as you go further east and south, the understanding of Ireland's exposure to Brexit lessens. We need to bring to the table a clear understanding of what outcomes we want, and clear solutions for how to get them. It was said repeatedly to a Fianna Fail delegation in Brussels this week that while Ireland was doing a good job laying out some of the challenges, it was not as clear in communicating the desired outcomes. Domestically, we need to step up our engagement with, and support of, the most exposed sectors, including agri-food. To date, activity on the ground has been piecemeal and inconsistent. Relative to the size of the challenge, the relevant State agencies - IDA, Enterprise Ireland, Bord Bia, Tourism Ireland, and so on - have been given pretty small additional funding. And we need stronger political leadership and coordination. For example, Fine Gael resists calls for a Brexit minister. We were told that Enda Kenny was our man in Europe, and that every minister was a Brexit minister. But the same people are now ousting Enda Kenny. We need to play the game of our lives and that demands clear thinking, hard work, skilful diplomacy, political leadership and, I imagine, not a little luck. Stephen Donnelly: Is Ireland ready to play its part in the countdown to Brexit?